Google had converted all blogger blog URL to country specific Domain addresses. People living in US will find a .blogspot.us domain and people from India see .Blogspot.in and so for other country.This change arise problem for social networking buttons and Facebook comments plugin and Facebook sharing links.If You are using .blogspot.in domain than you may not face this problem but if you are using custom domain than you may face such problem while sharing your blog post to facebook. 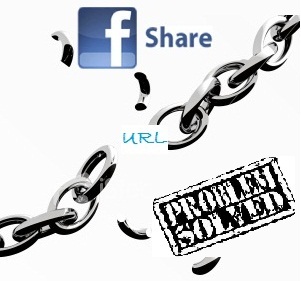 The Link You try to share may may not appear properly to the Facebook wall i.e. the link may appear without thumbnail and without its detail.The link is simply not accepted by Facebook. As Above Image Explain The above stating problem.Many of blogger face such Problem.I have found a easy way to solve this problem.You need not to change anything to your blog code.Yes very simple solution.Use Google URL shortening service goo.gl to solve such problem. first go to http://goo.gl/ and paste your Link which you want to share. Refer the above Image for help.You will get a shorten URL.Now Share this URL on your facebook Wall. Your Link detail with Thumbnail will successfully displayed in your facebook share. So Now Your Problem is solved.Enjoy blogging and share your post to facebook. If You like my Post than please subscribe to my blog feeds.Thanks a Lot. @Imran You are welcome buddy!!! I must be doing something wrong because I still can't get thumbnails and details to post to my FB page when I try to share. HELP!!!! I try to share music and videos from youtube occasionally onto my FB page. They're usually older songs and videos from the 60's and just random selections that I come across and want to share. Yesterday I tried to share several and I could only get 3 to post to my profile page using google url shortener, so I thought I might be doing something wrong. Which link are you referring to? @Vickie Welcome Bro!!! please keep visiting this blog..
OMG I think this actually fixed my problem Been searching for a solution and this one is so easy. I think my problem started when I switched to the new Blogger interface. I've been messing around with templates and switching back and forth between the new and old interface. Thank you thank you! Please use a Image at starting of Post so that that image act as thumbnail.. for your post. Thanks a billion!!!! I have tried other methods like ppl suggested e.g add &feature or something, but it just won't work. BUT this worked for me!!!!! Am so glad. I needed to try twice for this to work, but it worked most importantly!! Thank you once again!!!! why when I share a blog link on facebook the wrong picture comes up? Can you help me wit that? Stasha - I've found that when I share links to specific blog posts - as in, http://lacquerman.blogspot.com/2012/05/my-first-lippmanns-dancing-in-sheets.html - on Facebook, I'll get a thumbnail from the post itself. But if I only share the link to the blog, as http://lacquerman.blogspot.com, then Facebook only finds one image from a sidebar widget, which is never the image I want for my thumbnail. I haven't tried using a link shortener, but it should work the same way. Thank you for the solution. It worked like a charm. But I have one more question. This 'not posting thumbnail' problem does not happen with all of my posts. I published a post yesterday and it worked fine. Today it did not. 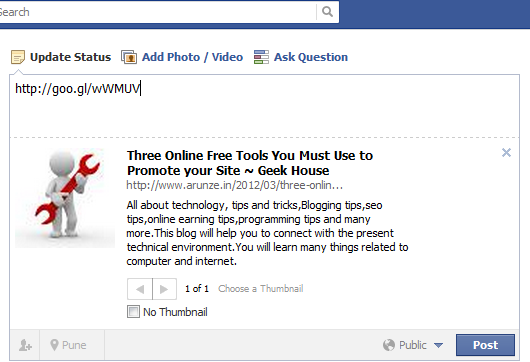 The thumbnail is problem is solved by your tips but I have Facebook like button added in my blog posts. The main problem is that even people like the post, the like count does not increase leaving a negative impact on my post. You Saved my Day! Thanks Buddy! Please help... I have tried exerything you said. Moving video, shortened ... Even I tried feature image. This never used to be a problem, only occasionally. Now every post, no thumbnail. This is long url, normally shorter, but still no thumbnail with others. Hey, thanks for this post! It worked! That was the only thing that worked, and I've tried everything! Seems to be a big process, I had the similar issue but when I used the proper link,it was solved. assume you're an expert on this subject. Fine with your permission allow me to grab your RSS feed to keep updated with forthcoming post. Thanks a million and please continue the rewarding work. I tried this with the google link you suggested and shortened the links, but still not getting video to show up..Can you help? Great article thanks a lot for sharing this useful info with us. оn hoω to get listeԁ in Yahoo News?
) I cаre for ѕuch infο much. I was loοkіng for this certain informаtion for а vеry lοng time. Тhanκ you аnd beѕt of lucκ. It's really a great and useful piece of information. I am happy that you simply shared this useful information with us. Please keep us informed like this. Thanks for sharing. I am sharing a video from my player to FB, first time it is not showing the thumbnail and other details. After refresh of same page it is showing the thumbnail and details. Hello Thanks for visiting and commenting here. I think You have problem with your browser cache.just clear your browsing data and try. Any way your video thumbnail will be visible to others user at first instance they need not to refresh their page. Please do subscribe to email feeds of this blog..
hello! first time seeing your site. I've been blocked by FB and I have tried the short url you mentioned in one of the replies and facebook is still rejecting the link. please assist. Thanks! Hey thanks for visiting my blog.This method is only support those links which are not banned or spammed by facebook or Google. If your link is banned by facebook than there is no way to trick facebook using above method. There may be some other methods like link redirection (which is also monitored by facebook and your redirecting link can be banned again).